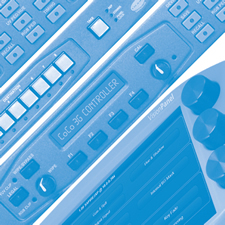 For those who enjoy hands-on control, Crystal Vision provides four hardware control panels – ideal for those live situations or where a board has regular adjustment. Each control panel is designed to provide operation of specific boards. Select VisionPanel and the SBB-4 smart button box for the general product range (including the chroma keyers), the SW808 Controller for the 8 x 3 routing switch and the CoCo 3G Controller for the colour corrector. Which boards can it control? VisionPanel is Crystal Vision's general remote control panel – designed for those who prefer their control from a physical panel rather than a PC. Featuring an easy-to-view eight inch touch screen and an intuitive menu structure, VisionPanel is a stylish 3U control panel designed to operate up to 16 Crystal Vision Indigo or Vision frames over Ethernet using standard CAT5 cables. Multiple VisionPanels can be installed – allowing any board to be controlled from a number of locations. It can also be used alongside the VisionWeb web browser control for simultaneous operation of systems. Providing a clear view of the frames and boards, VisionPanel is particularly well suited to those products that need regular adjustment thanks to its physical controls. It uses a combination of soft buttons on the touch screen, eight hard buttons and six knobs. The physical controls provide different functionality for different products. Assigned to the slider controls, the knobs – for example – are used to adjust the gain on the SYNNER 310 synchroniser and to adjust the detail enhancement on the Up-Down 3G up/down/cross converter – and make fine tuning easy in either case. VisionPanel features eight hard buttons - F1 to F8. The four buttons on the left allow you to select which board you want to control, with up to eight boards directly selectable by using these four buttons in combination with the Shift (F5) button. Should your system contain more than eight boards, you can easily select additional boards to control using the Device menu on the touch screen. The four buttons on the right were reassigned on 22nd June 2017 and are now Shift (F5), Presets/Outputs/Chroma Key Enable (F6), Gain and Spill/Key Status (F7) and Back/Home (F8). F6 and F7 are used exclusively for the chroma keyers. F6 will jump directly into the Outputs and Presets menu, allowing you to quickly monitor your incoming and outgoing signals or recall or store a preset. When F6 is pressed with Shift (F5) also held down, it will toggle the chroma key on and off. Holding down F7 will immediately access the Gain and Spill menu. When F7 is pressed with Shift (F5) also held down, it will access the Key Status menu. F8 will take you back through your previous menus; with Shift (F5) held down, it will instead take you to the board's home screen, where all the top level menu options are available. To get started, you simply enter the IP address of the frame (or frames) on your network, then press a discover button. VisionPanel will create a list of all the boards it finds in these frames; items can be removed from this list or entries moved up and down. Two useful VisionPanel features are frame and slot labelling and virtual cards. The user can give meaningful labels up to 24 characters long to frames and slots containing controllable boards, helping the operator understand exactly which board they are operating and its purpose in the system. VisionPanel software version V1.7 added GPI outputs to VisionPanel showing which of the first eight boards is being controlled, which can be used for selection of sources (when used with either a Crystal Vision switch such as SW803 3G or MultiLogo, or a third party switch) or as a light indication. In a multi-chroma keyer system, VisionPanel's GPI outputs could, for example, be used to trigger a switch to the Safire 3 currently being adjusted which can be used to drive a monitor. VisionPanel can sit on the included desk stand, be fitted into a desk or be rack mounted using the included rack mount kit. VisionPanel can be used with any Vision frames and with Indigo 'AE' or 'SE' frames running software V5.0 or later. The Vision frame software is currently at version 1.5 (released 2nd July 2018), while the Indigo frame software is currently at version 5.9 (released 2nd July 2017). The latest version of VisionPanel's own software (V1.7) was released on 4th December 2017. Older Indigo frames running V4.7 software or later can be updated to allow VisionPanel control. If you're running earlier versions of the Indigo front panel software, please contact our support team for an update feasibility analysis. The SBB-4 smart button box is perfect for live operation. With big buttons to press, it features clear text (using LCD graphics) and colour indications of function and status – such as the button flashing orange while counting down. There are three active buttons available for programming and one status button. One button box can control multiple frames and makes it easy to create powerful new custom functionality by combining controls from multiple boards. The SBB-4 works in conjunction with VisionWeb, with – for example – VisionWeb providing the set variables and status information. With the ability to be used with both Indigo and Vision products, the SBB-4 can be programmed to run any function available in the product XML files as well as receive status. The SBB-4 connects to the Crystal Vision frame via Ethernet. It is powered by PoE (Power over Ethernet) for convenience and therefore needs to be connected to a PoE enabled switch. The SBB-4 includes GPIs and so can also be used to add GPI control or status indication to Vision frames (or even Indigo frames), using the Ethernet control network. The SBB-4 will be customised to satisfy your individual requirements. You will be asked what functionality should be assigned to each of the push buttons. Ideal for live use and for making regular adjustments, the SW808 Controller is a dedicated 1U control panel for one SW803 3G routing switch. Fitting easily into any control desk and with a built-in power supply, it provides simple and tactile control in a familiar style. To change the routing, first press the destination button and then the new source button. The new source button will flash and the TAKE button will light – press the TAKE button to update the routing. In circumstances where the output selection remains unchanged, any source may be selected and routed to that output simply by selecting the source and pressing TAKE. Useful features include the ability to quickly identify which input is connected to which output – press the destination button and the source connected to it will light – along with the ‘off’ switch being dimly lit to simplify operation in low light. One source can go to more than one destination. This multiple routing can be performed by creating the required destination-source pairs before pressing the TAKE button. The destination buttons will flash to show that they have routing waiting for a take. To confirm the routing press the TAKE button and the selected routing assignments will all be updated simultaneously. Macros can be easily created by setting up multiple routing and pressing SAVE instead of TAKE. All the source and destination buttons will flash to indicate that a memory location needs to be selected. The source buttons represent macros 1-8, and the destination buttons represent macros 9-15. To recall a macro press RECALL, select a memory location and then press RECALL again to confirm. The SW808 Controller is designed to control the SW803 3G using a RS422 serial link. The control panel communicates with the Crystal Vision frame using the 422 Bus port at the rear of the panel. On power up, the SW808 3G Controller will automatically search for an SW808 3G. For more information on how to use the SW808 3G Controller, download the SW803 3G user manual. To do so you will need your Registered Area username and password – alternatively request a Registered Area password now. Ideal for live use, the CoCo 3G Controller is a dedicated 1U control panel for up to 12 CoCo 3G colour correctors. Fitting easily into any control desk and with a built-in power supply, it is simple and intuitive to operate and allows easy adjustment of most parameters. So what buttons do you get? There are seven shaft encoders on the right hand side of the control panel – each with a dedicated function – for the most commonly used adjustments. These are VIDEO (gain), CHROMA (gain), BLACK (level), RED (gain), BLUE (gain), GREEN (gain) and GAMMA. Also available are a set of nine buttons for panel menus and the more advanced functions: DEVICE, SAVE, RECALL, YUV GAIN, UV PED/HUE, RGB PED, MENU, CROP and TIMING. Finally, around the menu display you'll find a CAL button and rotary controller, a WIPE/BYPASS button and shaft encoder for before and after comparisons and a LEGAL button for legalising. Underneath the display are four F buttons which act as function select and status toggles. The CoCo 3G Controller is designed to control the CoCo 3G using a RS422 serial link. The control panel communicates with the Crystal Vision frame using the 422 Bus port at the rear of the panel. Using the RJ45 connector on the RM64 rear module allows one-to-one RS422 wiring from the CoCo 3G Controller straight to the CoCo 3G - allowing the same RJ45 cable to be used for any frame slot. The RJ45 loop-through on the RM64 also makes it easy to wire any number of CoCo 3G to the same control panel, simply by daisy-chaining RJ45 leads. On power up, the CoCo 3G Controller will automatically search for a CoCo 3G. Any CoCo 3G modules that respond will be shown on the display together with their slot numbers in the connected frame. The DEVICE key can be pressed at any time to show the connected CoCo 3G boards, and can be pressed again to show more CoCo 3G modules, up to a total of 12. To select the CoCo 3G you wish to control, simply press the function key below the desired board shown on the display. For more information on how to use the CoCo 3G Controller, download the CoCo 3G user manual. To do so you will need your Registered Area username and password – alternatively request a Registered Area password now.